This Strawberry Eclair Cake is made using Cheesecake JELL-O in the filling. Plus there’s no oven needed which means it’s perfect for the warmer weather! 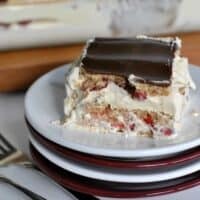 Chocolate Eclair Cake is one of my favorite desserts. It’s so easy to make too, and it feeds a crowd! If you’ve never made it before, it’s just layers of graham crackers with pudding (mixed with Cool Whip), then topped with Chocolate Frosting. I knew I wanted to make a strawberry version and when I saw the Sugar-Free Cheesecake JELL-O at Kroger it was calling my name. I used skim milk, Fat Free Cool Whip, and Low Fat Honey Grahams. Then I ate half a pan of this dessert and convinced myself it was health food. This dessert is perfect now that the weather is warming up. I love coming in from evening activities and serving my family a cool, refreshing dessert. We grow a huge strawberry patch in our yard every year and I can’t wait for the berries to be ripe so I can make more of this cake! Oh, and I think chocolate grahams would be delicious. Or chocolate pudding with the strawberries. Seriously so many options! In a large mixing bowl, combine both boxes of INSTANT pudding mix with milk. I used sugar free with skim milk, but choose what you prefer. Once blended, fold in thawed Cool Whip, set aside. In a 13×9 baking dish, lay full size graham crackers on the bottom. Top with half of the pudding mixture. Place half of the sliced strawberries on top of the pudding. Repeat layers with graham crackers, remaining pudding, and remaining strawberries. Top with one more layer of graham crackers. For the frosting, mix melted baking chocolate with corn syrup. Add vanilla, butter, powdered sugar, and milk and whisk thoroughly until smooth. Using an offset spatula, spread over the top layer of graham crackers. Cover and refrigerate cake for 2 hours or overnight. ENJOY. I made my own chocolate frosting (because I love the rich flavor paired with the light dessert). But if you want to buy canned frosting go for it! If you have the extra minutes though, TRY this homemade version, it’s quite tasty and very easy too. No pressure! You’ll love bringing this NO Bake treat to potlucks and parties! Chocolate Peanut Butter Lasagna is a no bake, light yet decadent dessert! Packed with flavor, you’ll watch this disappear in no time! Layers of cinnamon graham crackers, vanilla pudding and fresh banana make this no bake Banana Eclair Cake a huge summer hit! To top it off, I literally topped it off a cinnamon glaze! 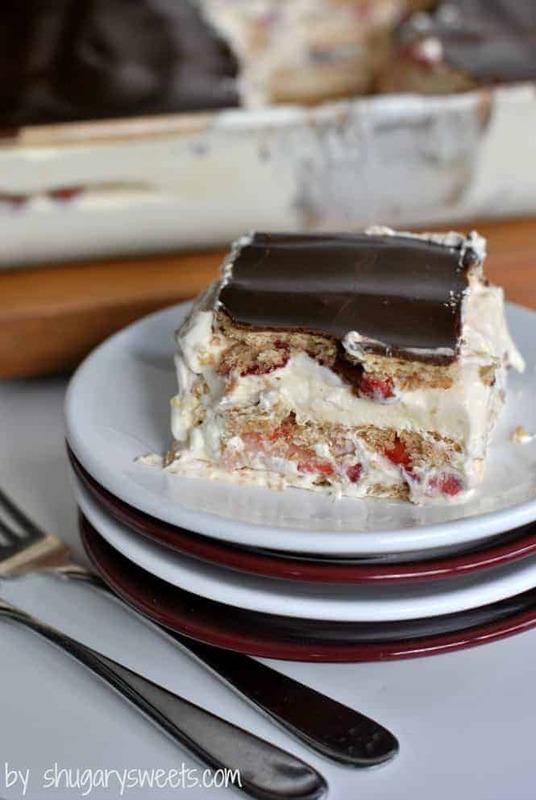 This Strawberry Eclair Cake is made using Cheesecake JELL-O in the filling. Plus there's no oven needed which means it's perfect for the warmer weather! Mix pudding mix with milk using a whisk. Beat for about 2 minutes, by hand. Fold in Cool Whip, set aside. Layer a 13x9 baking dish with one layer of graham crackers. Top with half of the pudding mix. Lay half of the sliced strawberries on top of the pudding. Repeat the layers with grahams, remaining pudding and remaining strawberries. Top with one more layer of Grahams. For the frosting, mix melted baking chocolate with corn syrup. Add vanilla, butter, powdered sugar and milk and whisk thoroughly until smooth. Spread over top layer of graham crackers. Cover and refrigerate cake for 2 hours or overnight. ENJOY! You can substitute a can of chocolate frosting for homemade if desired. What a beautiful dessert and I love eclairs. Our social Sunday is Live, come over to the party. What an amazing and easy dessert! I love nutella and strawberries. We have a crepe place that makes a nutella with fresh strawberries with whipped topping. It’s AMAZING!! Can’t wait to make this recipe!! I have 3 containers of fresh strawberries waiting to be eaten in my fridge. Thanks for the recipe! Really great cake for the warm weather and for strawberry season! Yum! What a great idea. I’m so jealous you have a strawberry patch! Love this recipe! I’m always looking for yummy treats to make in the hot summer months where I don’t have to turn on my oven! This one is now on my list! This looks fabulous, Aimee! Love that it’s no bake! It is nice having creamy, cool easy desserts to fall back on! We are a family that has to have dessert every single day, whether no matter the weather and no matter our schedule! Love this Aimee! Yeah, we like to have daily dessert too! This looks so creamy, delicious, and easy! I love eclairs, and the no bake thing is very appealing! Delish! 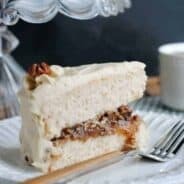 Thanks for sharing such a wonderful and easy dessert. You are so lucky to grow your own strawberries. As an FYI ~ I tried to save the recipe and it would not work. Hmmm, I just checked Pat and the save button seems to be working okay. Maybe there was a glitch. Sorry bout that! Thanks for stopping by. 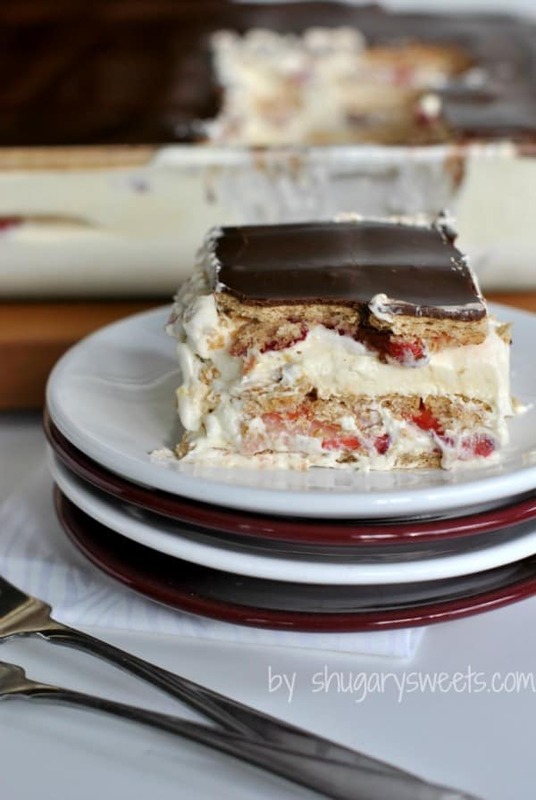 I love no bake recipes and your strawberry eclair cheese cake looks amazing!! Hooray for no-bake desserts! This one looks amazingly easy and something that everyone will love. Haha, love your honesty (and your menu)! I used to serve this too as MY signature dessert (with the French vanilla pudding). I’ve come a long way, but I still enjoy this dish! I may always enjoy it, LOL. This looks awesome. I haven’t really seen a cake like this but I am totally on board. Yep, I think you need to try it. Can’t wait to see what you make! haha, I’m tempted to make more varieties too! I’ve got a box of the Cheesecake pudding in the pantry and was wondering what to do with it…now I know. Yummo!! …and knowing is half the battle! Enjoy. Yum, this looks so good! It is a perfect dessert for a summer day, and so easy to make! Definitely bookmarking this one. Thanks! Thanks Becca! I just pinned your grilled chicken, will be definitely trying that when our strawberries are ripe!! haha! I love that you make stuff skinny and then eat a bunch…yup, that’s me too! How fun to have a strawberry patch in your garden…we tried to plant some last year. I’m thinking our yard doesn’t like fruits and veggies because nothing grows very well. I love this fun twist on the classic pudding dessert! Goodness gracious, give me some of this! It looks awesome, Aimee! I love that you added that strawberry twist .. perfect for spring and for my strawberry-loving mom for Mother’s Day! Ok so I am lovin this dessert and the fact you don’t have to use the oven! Well I’m so glad you found me! OK strawberry patch in the yard makes me jealous! lol. But not as much as I am jealous over not having a piece of that cake. Great post again! Oh goodness, this is calling my name 🙂 this looks wonderful! Sounds like my kind of treat- YUM. Thanks for sharing it. (17 years old) came into my head LOL.. but your version sounds freaking to die for!!! UGH need this in my life ASAP! 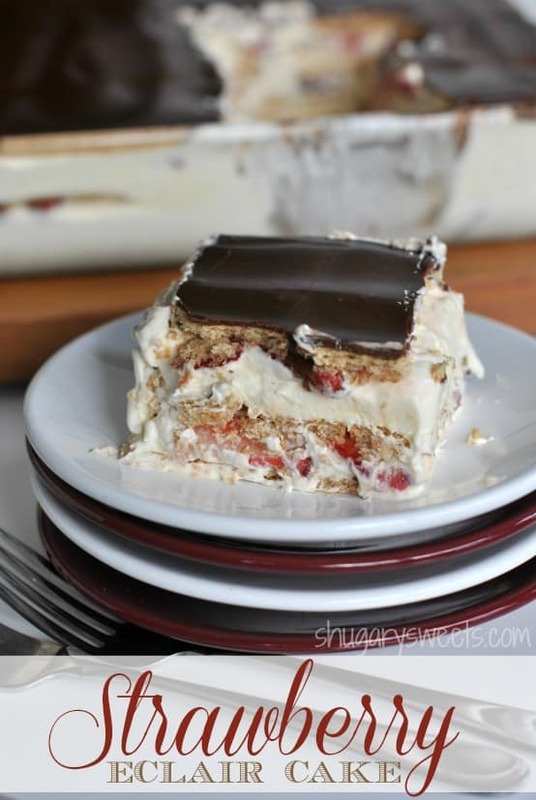 This eclair cake is just gorgeous Aimee! And, no-bake is obviously awesome as we approach summer – love it! Thanks Trish!! I love having an arsenal of no bake recipes for the summer! You have a strawberry patch? I am so jealous! Living in an apartment I have no green space to speak of. This cake is ideal for the hot weather Seattle has been getting lately. Turning on my oven is torture. I know. I’m so lucky! I love my fruits and veggies in my backyard! Sometime try chocolate grahams layered with white chocolate instant pudding and chocolate ganache over the top. Super yummy variation on this great dessert. Now that I see you’ve tried adding strawberries, I am wondering how the chocolate variation would be with strawberries in it, and maybe some chopped pistachios sprinkled on top!!! I love this dessert. I have made a similar one like this, but instead of chocolate icing, I used a can of blueberry pie filling and use French vanilla pudding. To die for dessert and so easy to make. Can make it ahead of time. Thank you for sharing this awesome dessert. Making it for our next family function. Oooh what a fun idea to use pie filling. I may be giving that a try too!! So I have made the regular eclair dessert in a pan, absolutely amazing, I like the addition of strawberries but I am using it for a baby shower so I wanted to make them in those individual plastic cups. Do you think if I crushed the grahams in smaller pieces, not like a crumb, and did a layer on the bottom of the cup, then pudding, etc. do think I would still get the same effect? I have a pint of strawberries sitting on the counter and wanted a new recipe and this is it! Now I have to get to the store and get everything else! can I just melt a tub of choco. frosting and use this as the topping? 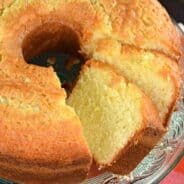 I know this post is years old, but, I’m just discovering it and bought the ingredients today to make it. It sounds wonderfully delicious. I have a question though. Did your plates accidentally match the dessert, or was that on purpose? Either way, it’s awesome! Eclairs are my favorite dessert! I love that this is a no bake recipe…can’t wait to make it! This is sooo good and best of all it’s super easy to make! Love strawberries and chocolate together! 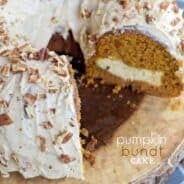 This is being made this weekend at my house! This is so perfect for strawberry season! We love how easy it is to throw together! This cake is delicious! It’s much easier than I thought it would be!